I'm showing a 2 channel video installation Roxane's basement, aka Low Level Vision aka Vega Estates. We tested it yesterday and it was more intense than I expected. The first video plays for 4 minutes, then is off for 4 minutes. 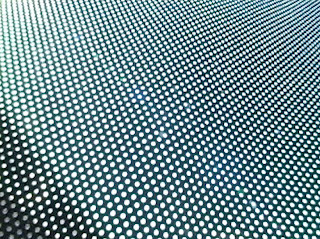 It looks like a shifty op art painting, but is actually a car window sun shade thing for kids. I shot it up close with a wide angle lens to suggest a spacial perspective. The original idea was to create something so optically disorienting that it becomes a visceral sensation. I think this is one tactic to locate the limits of our cognition. I've been into contradictions between the abstract and pragmatic, conceptual and visceral. The juxtopositions experienced are something of an everyday epiphany. The soundtrack for this video is the first real song i've made. For the most part it is gentle and harmonic, a slow lulling rhythm of hums, whistles, ticks and tones. It subtly increases the hypnotic effect of the imagery. Not that it matters, but I think it is fitting that the source material for the song was a recording of a toy top. I say it doesn't matter because the material is manipulated beyond recognition. However, I find a spinning top to have a fitting relation to the notion of locating the limits of cognition. The 2nd video loops consistently in the space behind the window shade video. It is a field of fireflies shot in rural Iowa. It is very dark but you can barely make out a landscape. The soundtrack is also from this nighttime nature scene, a sometimes melody sometimes cacophony of crickets, sacadas (sp), and 5 species of frogs. The low end of this sound is tweaked in order to add a droning bass of creapiness. Its beautifully unsettling. I'm also giving away about 35 copies of an ambient mix-cd. The cd's are screenprinted and the brown-bag cases and inserts are linoleum cut prints. I'll try to make it available to download. Anyone know how to upload an mp3? or a zip file? Email me if you want a copy. "Cole Pierce has been giving away mixed cd's since 2004. He collects music, burns a mix, decorates a case, and leaves small stacks in public. There's something about creating a mix cd that is intensely personal, even romantic. It's the kind of thing a person usually does for a close friend, family member, or significant other. That someone would do this on a public scale is curious. In the moment when the mixed album is given away, something personal is shared. Taste is perhaps one of the most intimate ways to identify someone and giving someone a collection like this is a way of revealing that hidden identity. A person might be attracted to the idea of a free cd, but the opportunity to take home a piece of a stranger's life may be more compelling. Yet this is also a very anonymous gift. There is no special thread that pre-exists before the cd is given, or taken. It's still a curiousity as to whether the free mixed cd creates this bond or only further emphasizes its absence." In "art video", "sound installation"